The Gift of Sisterhood, the Blessing in your Brokenness, and the chicken bone in my car. Five years ago I had breakfast with a fallen away Catholic, a lukewarm Catholic, and an evangelical Protestant. (Sounds like the beginning of a joke, doesn’t it?) I was the cradle Catholic who had just met Jesus Christ personally, and was longing for a community where I could share this new zeal for my faith, without looking like an absolute religious freak. And so we poured endless cups of coffee, and picked at a pound cake, and we talked about the important things in life like, “what do you put in your crock pot?” and, “got any new ways to prepare chicken?” But somewhere in between the crockpot and the chicken, Jesus appeared, and so the conversation went from what to make for dinner, to where do you stand with God? And the clock ticked and we all had places to go and no one wanted to leave, so we put on more coffee, because truly…the conversation had finally gotten good. It is important to note that this gathering of random women around the table to break bread would most likely have never had happened, had our community not just been shaken to the core by a mass shooting at our sweet elementary school just a few months prior. It was our suffering that brought us together, our wounds that connected us. And while the pound cake was delicious, it was the sharing of our brokenness that satisfied the emptiness. It was the “bringing it all back to God” that is what kept me hungry for more. And I left with a very strong desire to sit with a few women and wrestle with our brokenness and faith. Just one year later, practically to the exact date of that breakfast with friends, I was coordinating Walking With Purpose at my home parish. Make no mistake, this was not a coincidence. Our God is too powerful to waste time on a coincidence. And because our God is powerful, He is also a God who multiplies. That one table I dreamed of? He turned into ten. And because God thinks He is so funny, those few women I desired to share my faith with? He turned into 100. And four years later? The number of women seeking a sisterhood rooted in Christ continues to grow. And not only in my community, but all over the world. We are starving for face-to-face relationship. We are broken and dying for healing. So there I was, staring at 100 women, all staring back at me. I felt like Moses, and not because I have a full beard, although I am sure it helped. And I remember thinking, “God are you crazy? I can’t coordinate dinner for my family! How am I supposed to coordinate this? I am so broken…so lost, still…plus, my mini van has no door handles and what’s with the chicken bone I just found in the back seat? I am an obvious mess, Lord, and truthfully, I was kind of hoping someone else would do the leading…someone a little more put together, who doesn’t store poultry bones in her car… and I could just follow along.” And after I bargained with God, He sent me out to do what He called me to do. Brokenness and all. But it is a scary thing to do this, isn’t it? To be raw and real? To invite other women into your broken story? To admit that you live a less than perfect life, and along with that chicken bone in your backseat, you also happen to have a few skeleton bones in your closet? But I want you to know this: I have never been attracted to your perfection. I have never spent time listening to your cleaned up version of what life looks like, and walked away transformed. But your wounds? Your brokenness? That I am deeply drawn into. That I care about. That is always what connects me to you. Beautiful things happen when we allow ourselves to break open; when we invite others to break open beside us, when we step gently into our neighbor’s wounds. And I pray that you have this. My deepest prayer for you is that you have a safe place to land, a small group of women who lift you up and encourage you to grow in your faith and to hold onto hope; a sisterhood that walks beside you in your season of suffering and rejoices loudly with you when you are glad. 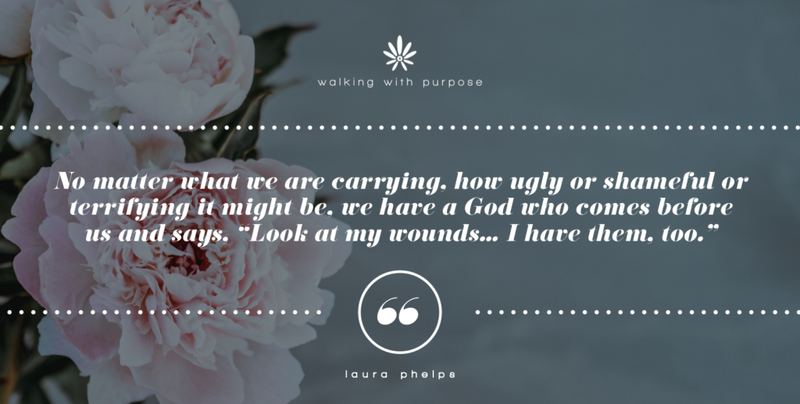 If you are searching for face-to-face, authentic friendship, I encourage you to go to the Walking With Purpose website, and click on Participate to find a group near you. There is an empty chair waiting for you, plenty of coffee, and you do not even have to shower or shave your beard or be fully on board with God to join us. Just come as you are. I have no interest in trying to make you believe that I have it all together and my life is perfect. Rather, I delight in sharing my wounds with you; the scars of my past, the pain of the present, I invite you into it all. Not because I am an over-sharer (which I am), and not because I have zero filter (which I don’t), but because I have seen how friendship is strengthened and sisterhood is created when we get real and share our deepest sufferings. When Jesus broke the bread, he didn’t keep it for himself. He said, “take this all of you and eat of it.” He shared it. He offered it to all of us. My sweet friends, let us never forget that the miracle always happens right after the breaking. The breakthrough always comes after the breakdown. And when we share, not conceal, our wounds, we invite others to face their own brokenness. Our suffering gives others permission to take the very first step that begins their own journey towards healing. That is the beauty in sharing our wounds. That is the gift of sisterhood. That is the blessing of being broken. P.S. I am so excited to be joining you this week on WWP Instagram Live, Thursday at 10 AM, and Facebook Live on Friday (time to be announced!) Get ready to meet some of warrior sisters in Christ, and how we encourage one another to be the fearless women God created us to be! I will also be sharing what is currently saving my life….and no, it is not the chicken bone.